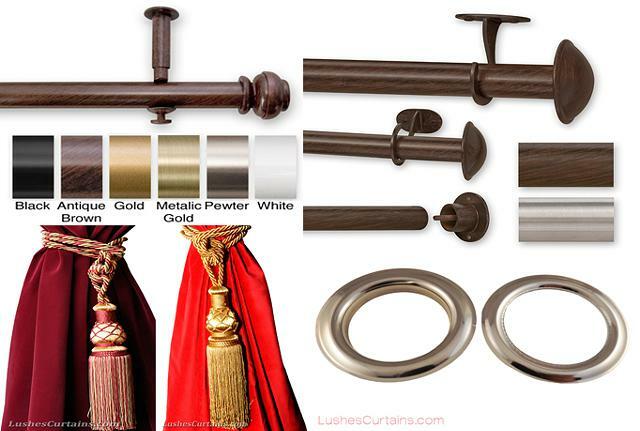 Welcome to Lushes Curtains, your source for premium velvet curtains and backdrops. When you need Los Angeles\\\' only trusted, reliable source of velvet curtains, backdrops and tie backs, Lushes Curtains is just a few clicks away. We offer one of the most comprehensive collections of ready-made curtains in the industry; all in stock and ready to ship or pick up today. All of our Ready Made Velvet curtains have a 4 inch Rod Pocket Top so they can be easily hung by any pole measuring 1/2\\\" - 3 1/2\\\" thick, which makes them easy to put up. We also provide Metal ring Grommets or Tab Top Options for a small additional charge. All of our curtains are professionally made and of High Quality Velvet! Since we manufacture our own Curtains, No One Beats Our Prices! If your looking for a different color just let us know so we can order it for you (usually takes 2-4 business days to get). Free Quotes! If you have any questions please feel free to email us or find us on any of our our Social networks.